Hey mummies and daddies! Looking for school holiday activities? 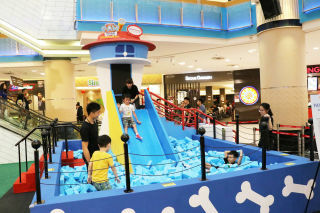 Join Leo, Leona and friends for loads of fun, free activities at Sunway Pyramid West from 26 May – 11 June! Here are 10 activities that you can enjoy during the school holidays, at no cost. These activities are suitable for kids aged 3-12 years old, so bring the whole family along for an unforgettable weekend! Meet and greet Sunway Pyramid’s roar-some mascots Leo and Leona, and snap a wefie with the friendly Kingston from The Parenthood! Get your bodies moving with The Parenthood’s interactive gym movement class where kids can learn how to have fun while stimulating physical and mental development! Aren’t these adorable? You can DIY your own Kingston figurine, clay animals, clay food and much more. Small or big, it’s up to you! Led by Sampah Menyampah, kids can learn how to recycle their used plastic bags and bottles into creative crafts! TakNakStraw – Say NO to plastic straws and replace with the earth friendly alternatives we could use instead. Fused Plastic Bag Flower Corsage Workshop – Turn plastic bags into lovely flowers as gifts for your loved ones! Colour in Leo & Leona! Get those creative juices flowing and get colouring! These balloons will put a smile on your face, no matter how young (or old) you are! Snap a photo at our photobooth and get it printed for free, courtesy of Wonder Photo Shop! Take a picture at the photobooth or participate in any of the programmes to be entitled for the lucky draw which filled with cash vouchers from all our tenants in Sunway Pyramid West. Spend RM80 at any of the Sunway Pyramid West tenant’s outlets to enter the lucky draw where you stand a chance to win Instax cameras from Wonder Photo Shop, Ukuleles from Shaka and The Parenthood Playland tickets! Always wanted to learn the Ukelele? Join our free Ukulele tutorial by instructors from Shaka with instruments provided! Led by professional instructors from The Parenthood, embark on fitness program that combines academic readiness skills which are specifically designed for children ages 3 – 6 years old. What are you waiting for? Embark on a Journey to the West today! For special workshops, kindly register via https://goo.gl/forms/7SvsiPLJSBH4h6Zu1. For more info about Sunway Pyramid West, visit https://www.sunwaypyramid.com/sunwaypyramidwest. Comfort Seoul Food @ DubuYo!